Gmail users who share Google Docs with friends and coworkers now have an easy way to preview documents right inside their inbox. The crafty folks at Gmail Labs have added a new way to peek at the content of shared Google Docs documents, spreadsheets, and presentations without opening them in another tab or window. The feature follows previous preview features for YouTube videos, Google voice, Yelp reviews, and Flickr and Picasa albums. 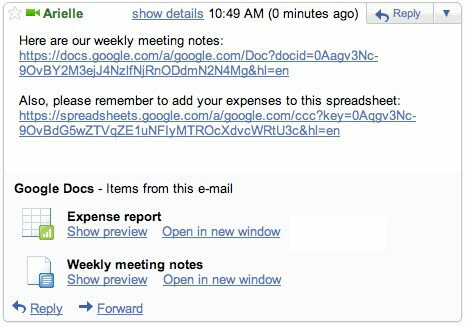 Google Docs previews in mail can currently be activated under the "Labs" tab in Gmail settings. Gmail will automatically detect when Docs files are linked within an email and display the name and type of document below the email.